A curator, teacher and critic, Jón Proppé has in recent years directed several exhibitons, as well as writing and lecturing widely on art, philosophy and cultural issues. He currently writes art criticism for the Reykjavik daily Morgunbladid and is general editor of the art.is web site. Born in Hafnarfjördur, Iceland, in 1962, Jón Proppé studied philosophy at the University of Illinois and spent eight years in the United States and Britain. Since returning to Iceland in 1987 he has worked as editor in several publishing houses and as curator and art critic, in addition to teaching art history at the University College of Education in Reykjavik. Jón Proppé has written extensively about art and his interests cover a wide spectrum, from the historical to the most contemporary currents in art. Much of his research, though, has focused on abstraction in art, both in painting and in more concept-based works. 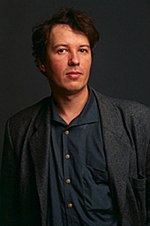 He has also written and lectured on the nature of criticism and the relationship of art and critical discourse. Critic Jón Proppé reflects on the relationship of artworks and critical discourse, raising some doubts about the formers claim to privileged status.